Payday loans are very attractive solutions to a sudden financial struggle. However, a payday loan is essentially a band-aid, and an inefficient one at that. It temporarily stops the bleeding, but as we all know, taking off the band-aid is almost more painful than the initial cut itself. Unlike a bandage, payday loans don’t only cause pain at the end, they are harmful, short-term solutions that will cause problems for their entire duration. Here are a few things you should know before considering an online payday loan. Your information is not secure. Payday loan lenders want to make money off you any way they can. To them, their high interest rates are often not enough, so they use you for your information. Many marketing agencies, companies, and other third-parties want your information. Payday lenders will often sell your private information for an extra profit. You pay more interest than principal. The longer it takes for you to repay a loan, the more money a lender makes. 30% of recipients had loans set up to only repay the finance fee; but because of the transaction fees and interest, you never actually begin to repay the loan. In this way, lenders make money off of you with no end in sight. There is a high chance you will become a victim of fraud. 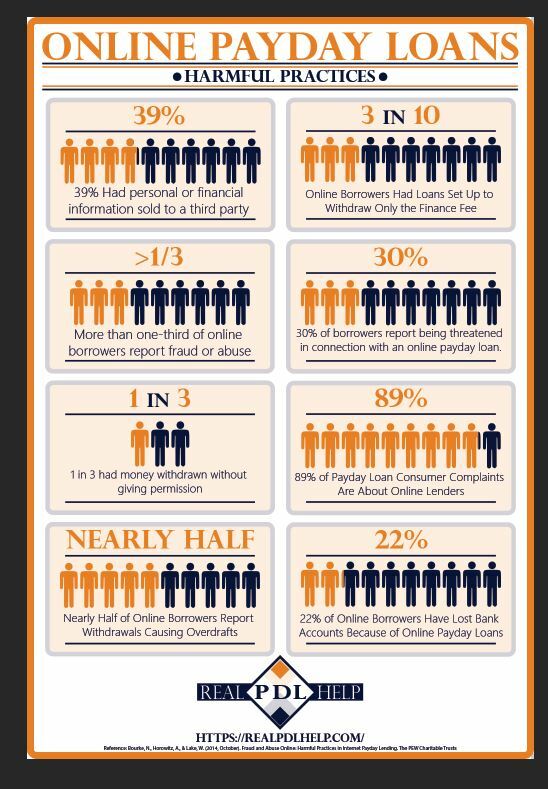 Many online payday lenders are not properly licensed and will sell your information to anyone they want. Some of these third-parties are fraudulent. Many people have reported being contacted by supposed debt collectors even though they did not owe any more money. You may be troubled by threatening calls. It is no surprise that about the same amount of people who report fraud also report being threatened in connection to the loan. It is a common practice for fraudulent companies to threaten their victims with lawsuits, increased fees for failure to comply, and other legal action. Even if you are not dealing with fraud, many people report that their payday lenders have become abusive if they default on payments. Many people don’t realize how intrusive a payday loans can be. Many contracts stipulate that upon default of payments or other violations of the contract, money can be seized from your bank account. If you don’t read through all the fine print, you can also be surprised when money you needed suddenly vanishes. Almost all complaints about payday loans are about online lenders. Payday loans are very tricky, potentially dangerous arrangements. The promise of quick cash can make people make poor, hasty decisions. We recommend you take extra precaution whenever conducting online transactions, especially with companies asking for highly sensitive information. It is much easier for non-licensed and fraudulent companies to trick you online. As a direct consequence of payment seizures, borrowers frequently report overdrawn accounts. If a company has access to your account and decides to collect money, they will not care to review what the bank balance is before overdrawing from the account. They will take the amount they want and leave you with the overdraft fees. It is possible to lose your bank account completely. Overdrawn accounts, despite leaving you with no money and additional fees, can result in the loss of your bank account. Banks are not patient with customers who owe money and have deficient accounts. You become a liability and their best choice is often to simply close your account. So take caution when considering a payday loan, especially an online payday loan. If you have already experienced a few of these harmful items, give us a call and discover how we can help you get out of bad payday loans today.